Hundreds of people have turned up to sign the stem cell register and donate blood to help a boy with blood cancer. Oscar Saxelby-Lee needs a transplant within three months of chemotherapy or his chances of survival will "severely diminish", his family said. The five-year-old has T-cell acute lymphoblastic leukaemia, an aggressive form of the disease. The registration event run by Oscar's school is "absolutely brilliant" its head teacher said. Pitmaston Primary School in Worcester hosted the event earlier and saw more than 300 people turn up in just two hours to give a swab sample and donate blood. 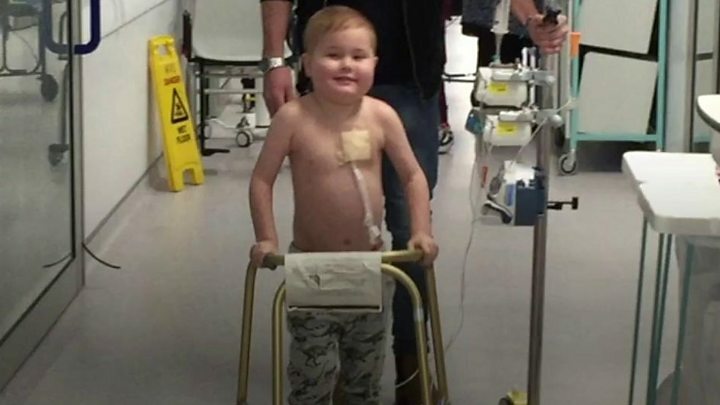 Oscar, who is currently under the care of doctors at Birmingham Children's Hospital, has so far had 20 blood transfusions and four weeks of chemotherapy. Kate Wilcock, head teacher at Pitmaston Primary said: "We are doing absolutely everything we can to push and find him a stem cell donor, that's what he really needs." About 80 volunteers are working in shifts to process each person that signs up to donate. "Numbers matter hugely because obviously we know we're looking for a particular tissue match for Oscar. "The more we have, the more chance we have of finding that golden person who is Oscar's match", Mrs Wilcock added. Image caption Sarah Gray of blood charity DKMS said finding a match was like "winning the lottery"
Sarah Gray, of blood cancer charity DKMS, said stem cell transplants were required when a patient's body was not producing blood cells correctly. She said: "It's really difficult to find a match, it's essentially like winning the lottery. It's very complex and so the more people we can get on that register, the more chances there are to saves lives of patients like Oscar."